Welcome to the new school year - Year 6 2019. An exciting year ahead - the last year at primary school before heading off to the next stage of your school education journey. We started the year looking at the Connections we have. 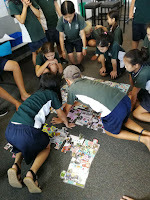 Connect is one of our school values and will be a focus this year, alongside Respect and Challenge. We each completed a jigsaw piece of pictures and words that represented us. Our Jigsaw is displayed throughout the year. This shows that we are 30 small pieces but together we make the whole. There are 2 gaps presently in our jigsaw; these will be completed when two students come back for the year.